We like footballers to be on-message when they talk, to speak about knife crime (against), isotonic drinks and potato crisps – two of your five a day, kids! – (for) and betting (do it lots because..
Presnel Kimpembe is adamant Paris Saint-Germain are not harbouring psychological scars in the Champions League and that the last-16 capitulation against Manchester United was a case of taking their..
A late VAR review gave Manchester United a penalty that proved to be the difference in the Red Devils advancing to the Champions League quarterfinals. 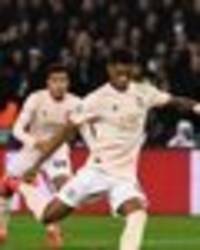 SI's Luis Miguel Echegary weighs in on the match's..
Marcus Rashford scored a dramatic late spot-kick to send his side through after the referee consulted VAR on a handball by Presnel Kimpembe. Arsene Wenger was called a ‘genius’ by fans after identifying Presnel Kimpembe as Paris Saint-Germain’s weak point against Manchester United. What is even more remarkable is that he made the..
Steven Gerrard thinks it would have been an injustice if Manchester United had been denied a last-gasp penalty against Paris Saint-Germain in the Champions League. Marcus Rashford scored a 94th minute..
Romelu Lukaku has been praised for showing a ‘touch of class’ after Manchester United knocked Paris Saint-Germain out of the Champions League on Wednesday. United became the first club to qualify..
Manchester United caretaker manager Ole Gunnar Solskjaer hopes the club’s controversial stoppage-time penalty against Paris Saint-Germain was the “right decision”. United benefited from a VAR..
Neymar was furious with the dramatic late penalty awarded to Manchester United in Paris Saint-Germain’s stunning Champions League loss. 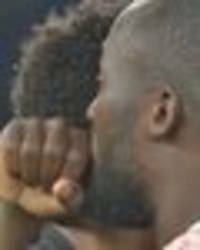 Marcus Rashford converted a 94th-minute spot-kick to give..
ROMELU LUKAKU displayed his class as he offered support to Presnel Kimpembe immediately after Manchester United eliminated PSG from the Champions League. MANCHESTER UNITED fans have hailed the referee after they were awarded a controversial late penalty - and they’ve also slammed PSG victim Presnel Kimpembe. Liverpool will attempt to become the second team to beat Manchester United under Ole Gunnar Solskjaer on Sunday following Paris Saint-Germain’s Champions League victory at Old Trafford. A composed..
Ander Herrera insists Manchester United can still reach the Champions League quarter-finals despite their 2-0 first leg defeat to Paris Saint-Germain. 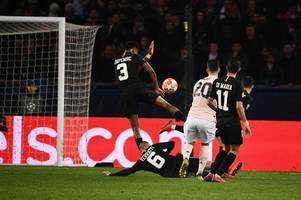 Goals from Presnel Kimpembe and Kylian Mbappe gave..
Eric Bailly concedes Manchester United’s morale dipped after conceding the first goal in Tuesday’s 2-0 Champions League defeat to Paris Saint-Germain. The Red Devils had contained the Ligue 1..
Dani Alves said Paris Saint-Germain have to win the Champions League once and for all this season following their first-leg victory over Manchester United in the last 16. Presnel Kimpembe and Kylian..
Paris Saint-Germain made their Champions League win over Manchester United “seem easy”, according to goalkeeper Gianluigi Buffon. PSG outclassed United 2-0 in the opening leg of their last-16..
Thomas Tuchel said it is only “half-time” in the Champions League last-16 tie as the Paris Saint-Germain head coach remained grounded following Tuesday’s 2-0 win against Manchester United. PSG..
Ole Gunnar Solskjaer accepted Paris Saint-Germain were “levels above” Manchester United in inflicting his first defeat since taking temporary charge. United were outclassed by the Ligue 1 leaders.. The honeymoon is over for Ole Gunnar Solskjaer as he experienced his first defeat since taking charge of Manchester United on Tuesday night, after Paris Saint-Germain won 2-0 at Old Trafford. Goals..
Ander Herrera insisted Manchester United must still believe they can turn around their Champions League tie with Paris Saint-Germain, despite suffering a 2-0 defeat at home in the first leg. Presnel..
Paris Saint-Germain’s 2-0 win does not mean Manchester United are unable to qualify for the Champions League quarter-finals, said Ole Gunnar Solskjaer. 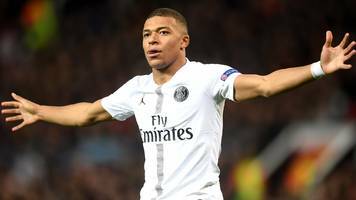 Presnel Kimpembe and Kylian Mbappe converted..
Kylian Mbappe said Paris Saint-Germain must not feel fear after a 2-0 win at Manchester United established a dominant position in their Champions League last-16 tie. Mbappe doubled PSG’s lead after..
Paul Pogba will miss Manchester United’s Champions League Round of 16 second leg tie away to Paris Saint-Germain. But the Frenchman will be able to return if United can overturn tonight’s 2-0..
Paris St-Germain stun Manchester United with a dominant performance at Old Trafford to take charge of their Champions League last 16 tie. Paris Saint-Germain are in the box seat in their Champions League last-16 tie against Manchester United after claiming a 2-0 victory in the first leg at Old Trafford. Goals from Presnel Kimpembe and..
Manchester United suffered the heaviest home defeat in the club’s European history in losing 2-0 at home to Paris Saint-Germain. 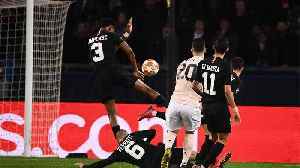 Second-half goals from Presnel Kimpembe and Kylian Mbappe earned PSG,..
PSG took control of their Champions League last 16 clash against Manchester United with a 2-0 victory in the first leg at Old Trafford. Two priceless away goals from Presnel Kimpembe and Kylian Mbappe..
Paris Saint Germain put in a stunning second-half showing to win 2-0 at Old Trafford against ten-man Manchester United on Tuesday evening. Despite Thomas Tuchel’s men absorbing considerable pressure..
Paris Saint-Germain have beaten Manchester United 2-0 at Old Trafford to open up a commanding lead in their Champions League Round of 16 tie. MANCHESTER UNITED fans are not happy after Presnel Kimpembe scored the opening goal of their Champions League clash with PSG. PSG were the first to score in an intense Champions League encounter against Manchester United on Tuesday night, and former Red Devil Angel Di Maria had a word or two of the Old Trafford crowd. He might have scored the winner in the first half of PSG’s 2-1 triumph over Liverpool in the Champions League on Wednesday night, but Neymar also produced a terrible decision that made him look..
Olivier Giroud has managed to land himself a role as the Green Goblin in the newest Hollywood blockbuster ‘Spider Man New Generation’. The Chelsea star will lend his voice to the iconic villain for.. The Halloween is here and the clubs around the world are pulling off all sorts of stunts. One such was seen at PSG where first-team stars were invited to take part in a spooky challenge. Kylian Mbappe,..
Presnel Kimpembe will miss Paris Saint-Germain’s Classique clash with Marseille on October 28 after he was handed a three-match ban following his red card against Lyon. Kimpembe was dismissed..
Kylian Mbappe and fellow World Cup winners Alphonse Areola and Presnel Kimpembe are back in the Paris Saint-Germain squad. The trio missed PSG’s first Ligue 1 game of the season, a routine 3-0 home..
World Cup winner Presnel Kimpembe has signed a new five-year contract with Ligue 1 champions Paris Saint-Germain, the club announced on Monday. Academy product Kimpembe has become an increasingly.. According to Le Parisien, Paris Saint-Germain are set to offer Presnel Kimpembe a brand new deal amidst speculation over his future. The 23-year-old has been linked with a series of different European..
Paris Saint-Germain feted their trio of World Cup winners in some style as they made their return to the club for pre-season. 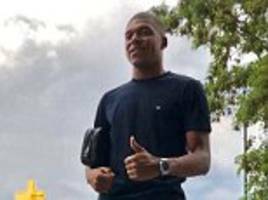 Kylian Mbappe, Presnel Kimpembe and Alphonse Areola were welcomed. France may have knocked out Lionel Messi’s Argentina at the World Cup but they found Presnel Kimpembe impossible to beat in training on Tuesday. 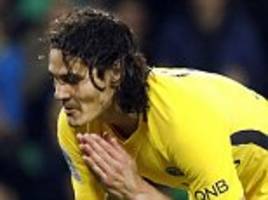 The Paris Saint-Germain centre-back turned into a..
A nine-match unbeaten run in Ligue 1 looked to be reaching its conclusion after Remy Cabella struck a first-half goal, then PSG had defender Presnel Kimpembe sent off just before the break. Serie A giants Inter Milan are said to be keeping a close tab on Paris Saint-Germain central defender Presnel Kimpembe. The 22-year-old France defender is a highly regarded talent who emerged as a..
Paris Saint-Germain captain Thiago Silva has been dropped for the Champions League last-16 first leg with Real Madrid on Tuesday. Head coach Unai Emery has made the shock decision to start youngster..